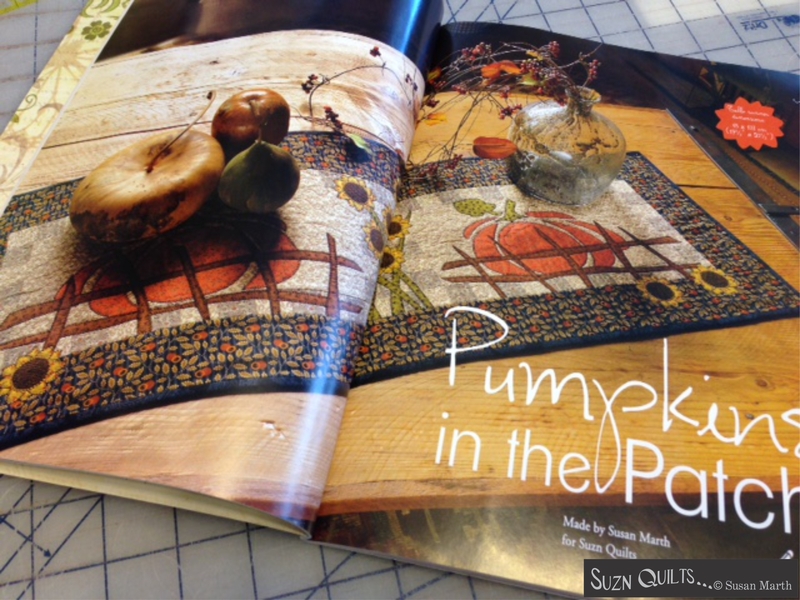 Applique quilt projects | Quilting my way through life! I ALWAYS come back from market with a million & one things to get done. Top that off with the stuff that was ignored because of market prep (perhaps months worth of stuff) and before you know it I can’t even remember going to market so I forget to post any market photos or tell you of my new patterns. Good Grief! I miss my brain! The best part of market was getting to spend time with both of our daughters! Chloe has helped me lots of times, but this time Clare was able to go with us. 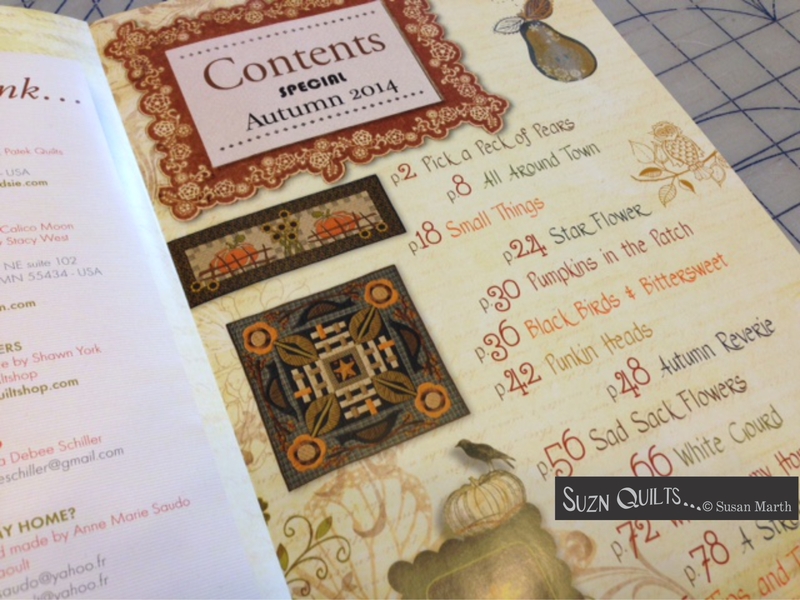 I have 14, yes, 14 new patterns! So, let me show you the first one, Baker’s Dozen. I made fabric decisions; background squares vs. 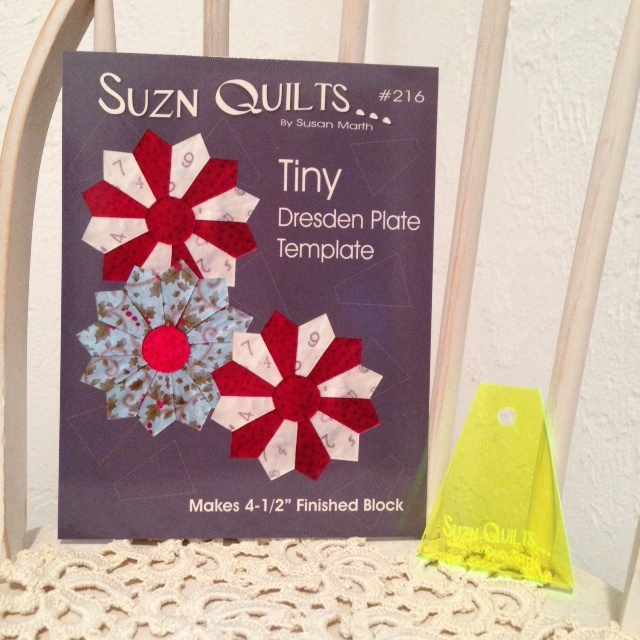 Tiny Dresden petal squares. Taking pics like this helps me remember what I had decided. Thank goodness for artificial intelligence! Then I set to cutting. 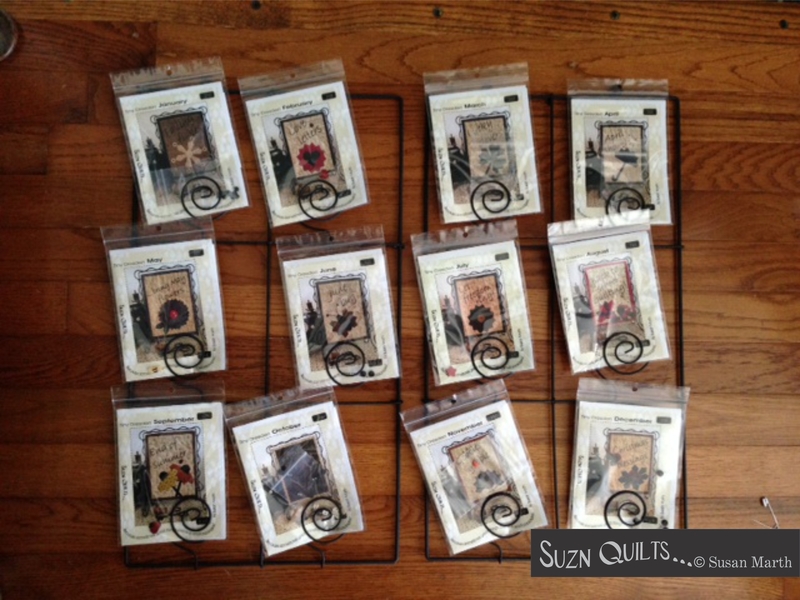 I can cut 6 petals from each 5″ charm square. In my pattern I show you how to do that. 14 Tiny Dresden plate blocks in the making. Again, thanks to my phone for capturing and helping me to remember all of this! I did all this the summer of 2016. At least that’s what my pics say. And now I regret to inform you… I just found a bunch more images that I forgot I’d even taken. I started sewing petals… It was so interesting that even Dori (RIP) had to stop what she was doing to watch me! Before long I had this beautiful pile ‘o petals. 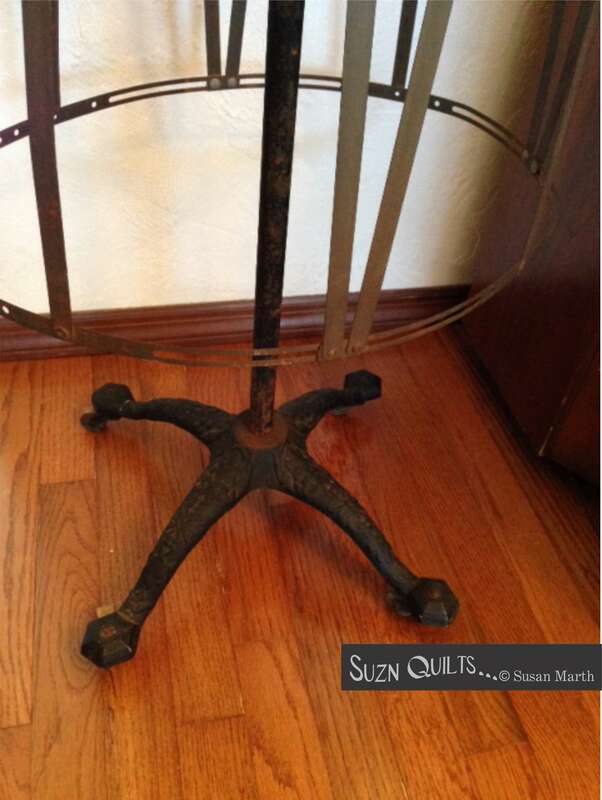 Blake & I had recently gone to an estate sale where I found this adorable little iron. I cut the string apart. Unfortunately the iron is just a toy, but cute! I pressed with my un cute iron. Then turned them all right-side-out. took me two years to make, Lol! Then sewn together into pairs. Then strung up over my cute little cutlery box (OH, GOOD GRIEF!). Pressed & then sewn to another pair. Finally the complete plates were completely sewn. This is where they get more Mary Ellen’s Best Press. 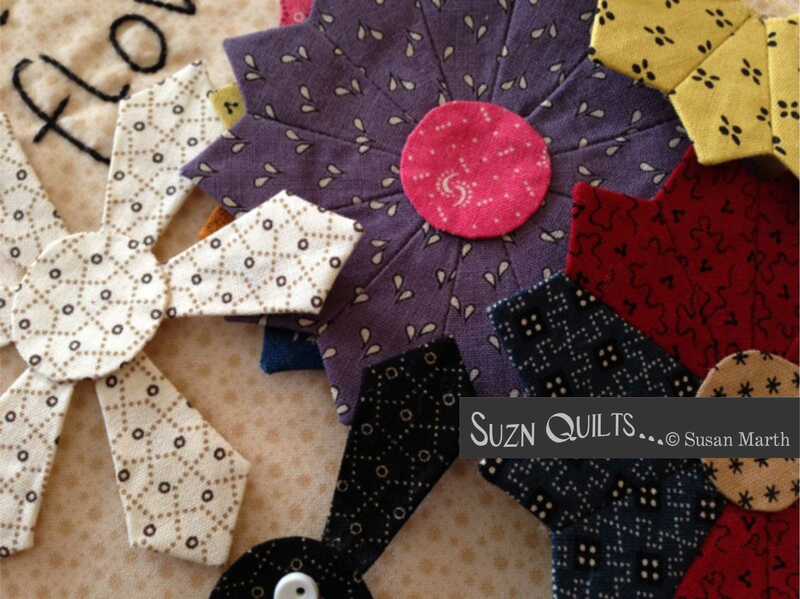 Next to make and applique the center circles, wet them to remove center templates & let dry. And press again with more Mary Ellen’s Best Press. For a minute I thought they may look nice around this beautifully stitched picture, but no. Set with this cute sashing, but no. Maybe with black cornerstones, no. This is where my brain took a hiatus from this madness. No more pics until Augusts, 2017! I found this adorable metal box at Litchfield’s Picker’s Market and it inspired me to get the blocks out & finish a quilt! I decided that I liked them set next to each other best. Then I dreamed up these incredibly cute cornerstones. That required a few more petals & circles. The original pink polka dot that was part of the collections wasn’t “it”. The black really set off the blocks. Next, I pin basted & quilted it myself. Than chose a binding fabric. Those poor pink dots… I wonder whatever happened to them. The perfect binding fabric I think. 12 Tiny Dresden blocks, with one more (in 4 pieces) on the corners. Thanks for taking that trip back in time with me. 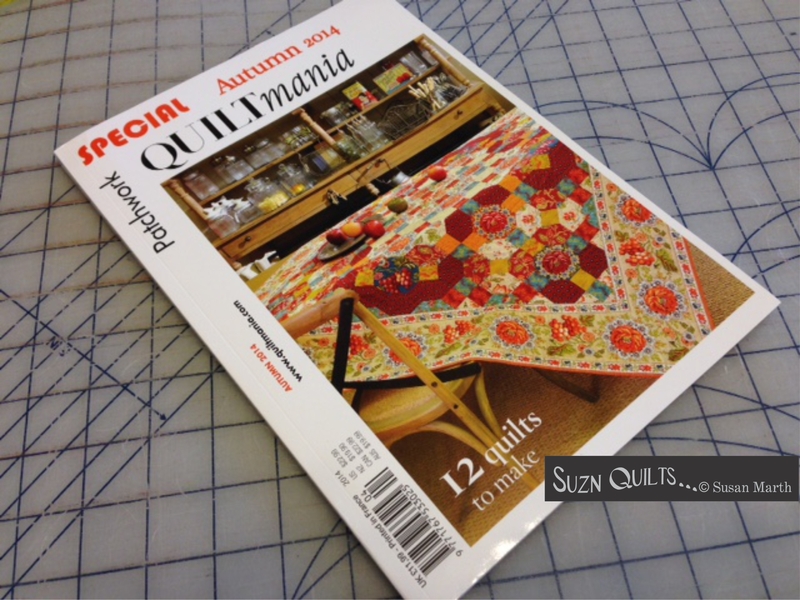 I’m so excited I received my copy of AQS’s American Quilter magazine this week! 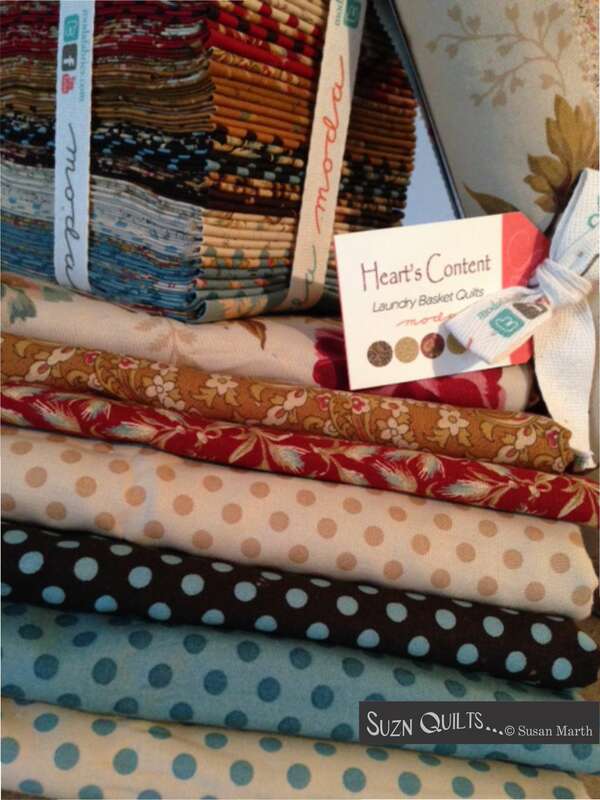 My very good friend, Robin Koehler has a stunning 5 part quilt series included!!! Of course I have to make my own. then set to cutting & sewing. Robin mentioned earlier in the week how the templates for the applique placement needs to be enlarged 200% because the size of the blocks is bigger than the magazine page and wouldn’t it be cool to make them the size of the printed page instead and then reduce the size of the whole quilt??? Robin mentioned it in her Facebook group today too… so…. 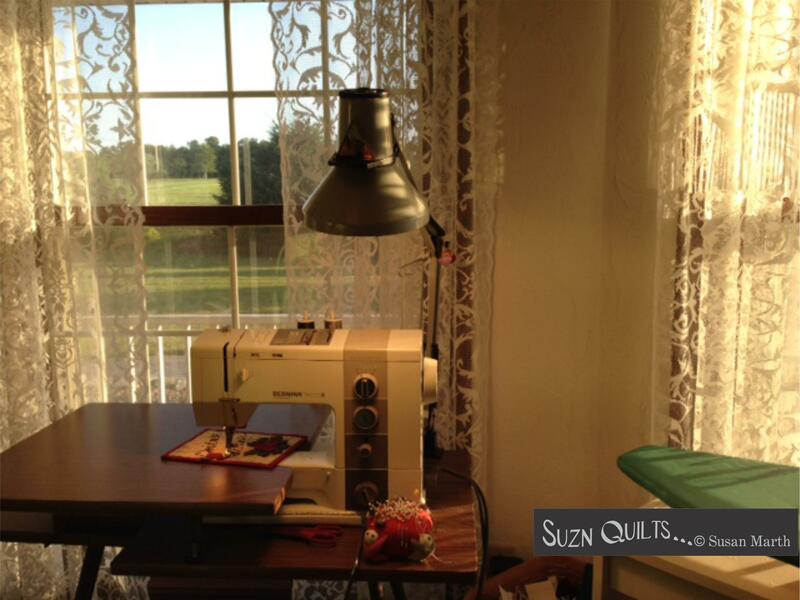 This afternoon I set to Best Pressing all of my fabrics and started cutting & sewing. Soon I had all of the half-square triangle blocks made. 12 light/medium & 12 medium/light, Bazinga! I just made 2 piles admiring beautiful fabrics & the precision of my blocks. Then I made them into the pinwheel & square in square blocks. Next, I made the tiny bias tubing. but I literally had to wipe the dust off the package because I’d never used it! It’s just as easy to use as the bigger sizes that I’ve made many times. You just start with smaller size bias strips. 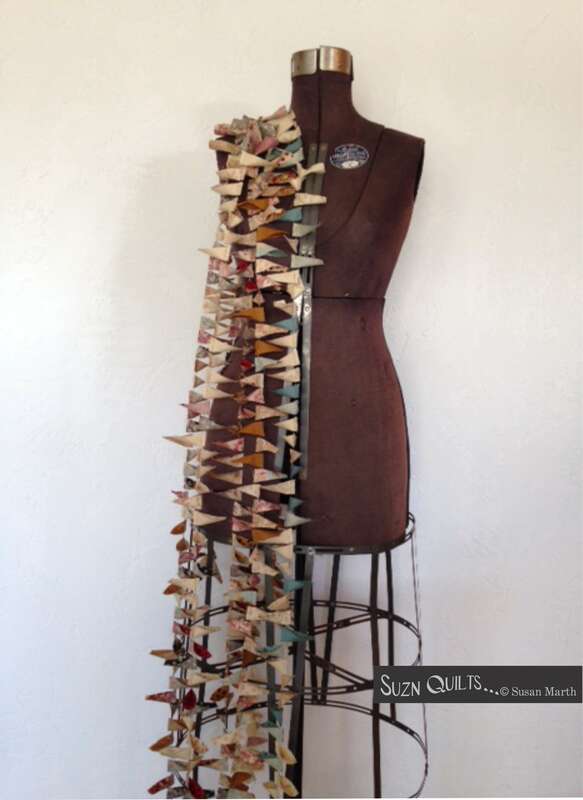 the pattern actually uses the 1/2″ size bias tube maker. Next, I copied the placement page & cut through it with my baby rotary cutter so I could draw through it with a pencil to mark the placement of the vines on each block. I think it’s easier than using a light box to trace the design. My Apliquick tool came in handy for turning & gluing the raw edge of the tube under before gluing it in place. Before long I had all 6 blocks stitched! Having precise instructions, nice fabrics & the right tools made this super easy & precise. Perhaps you should make one too! 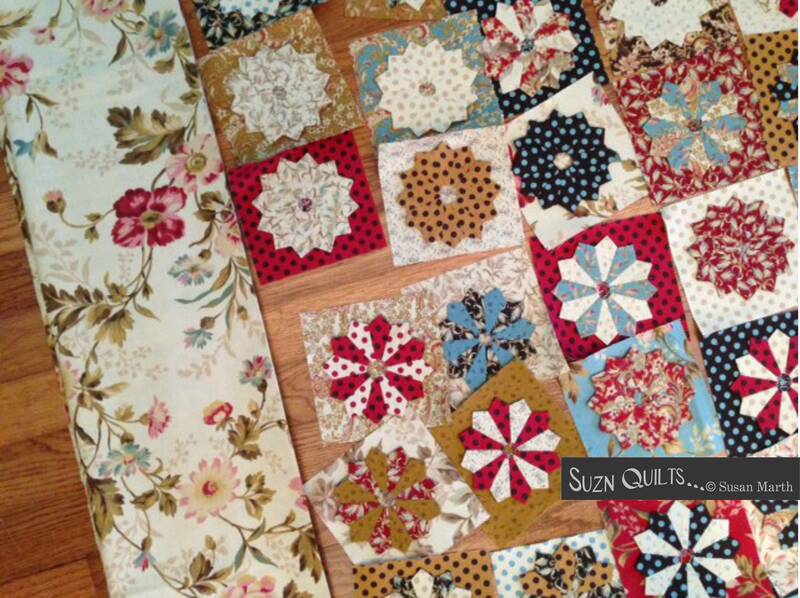 BTW, Robin has a FB group started for everyone interested in making the quilt along with her.